North Pavilion is a 2 storey, fully glazed cuboid attached to the original red brick bell tower of the old Royal Infirmary hospital and forms the north side of the new urban square at the heart of the Quartermile development. The shell was designed by Foster and Partners and required a full fit out including services, upper floor and finishes. At the upper level we designed and installed a fully functioning commercial bakery to service the growing number of Soderberg bakery shops around Edinburgh. 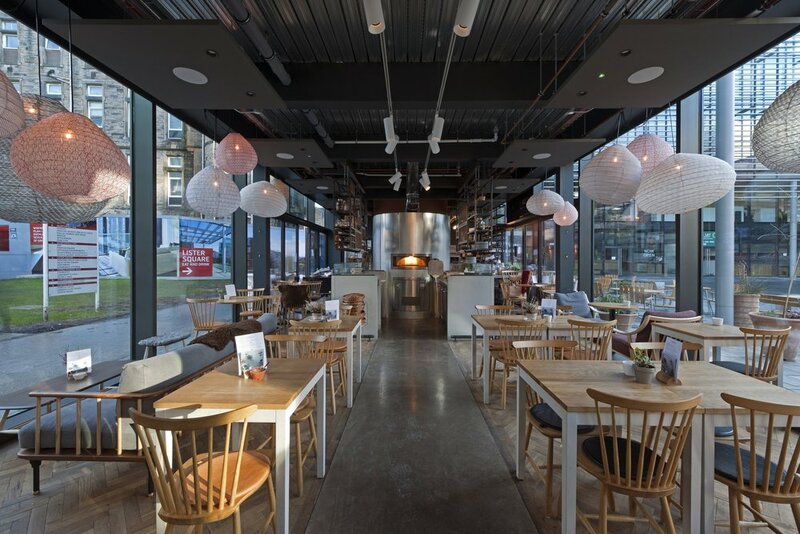 At the lower level we designed and formed a pizza restaurant with central, zinc clad pizza oven, polished concrete floor, exposed, coordinated services at high level and furniture from Swedish designer Nirvan Richter. The narrow aspect and fully glazed facades provided a thorough test of our design abilities!